The East Cornwall Youth Football League is comprised of member clubs from all corners of the county. 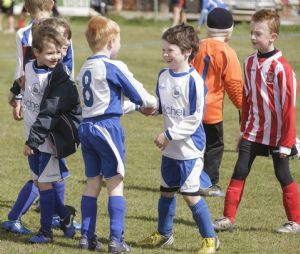 With players from under 7 through to under16s, and involving mixed, boys and girls teams – the league encourages participation from all ages and abilities. The ECYFL is an award winning league. The league was the county’s first youth league to be awarded the FA Charter Standard. In 2012 we were awarded the FA Respect Bronze award in 2013 the league was presented with the Charter Standard League of the Year for the whole south west region. The Coach of the Year award has been recently held by coaches of clubs in the East Cornwall Youth Football League. Our league understands that all players develop and improve by playing more football. All mini soccer teams are encouraged to ensure young players who attend match days have at least 50% game time on the pitch. The ECYFL has also endorsed an innovative approach to the structure of mini soccer. Instead of playing one long season from September to May, the season is split into several mini seasons. Each mini season encourages development games and ends with a Competition Day, after which a new mini season will start. This encourages immediate feedback to the young players and formative feedback to the teams. In the middle age groups, there is again less emphasis on one long campaign and a variety of competitions are provided to present fresh challenges throughout the season. The ECYFL was one of the first leagues to introduce 9-a-side football to help bridge the gap between mini soccer and 11-a-side. This season we are one of the first leagues ever to introduce 5-a-side formats for the U7 and U8 age groups. In our girls section, we support the use of multi format games to accommodate the growing girl’s game and facilitate as many games as possible. The ECYFL is also the first league to regularly utilise central venues for league fixtures. This concept develops the relationship between all teams competing in a competition, helps build a one-community spirit and also enables the league to ensure standards, rules and RESPECT codes are kept to an acceptable standard. As a league award winner, the ECYFL places RESPECT high on its agenda. It is a requirement that all coaches, officials, players and spectators sign and abide by codes of conduct when engaged in football activities. The league uses RESPECT ambassadors to visit matches in a planned and also unannounced manner. Teams are required to ‘score’ their opponents on how well they uphold the codes of conduct and awards are presented annually to the teams with the best achievements.